Very few people are born with naturally perfect teeth. Most of us have an imperfection or two we’d like to fix. Thankfully, your cosmetic dentist in Canton, Dr. J.D. Robison, can provide the answers to your smile problems using several popular procedures. He can take what nature gave you and turn it into the smile you’ve always wanted. All our cosmetic treatments can be made to suit your exact wants and desires. Cosmetic dentistry primarily deals with aesthetics, of course, and that means it requires a bit of an artistic touch. Dr. Robison has the skills and experience to give you the exact kind of results you want and will always work with you to make sure that you leave his office happy. Our team at the Robison Dental Group offers several cosmetic dentistry services that can enhance just about every aspect of your smile, including cosmetic bonding, teeth whitening, porcelain veneers, and Invisalign. Why Choose Robison Dental Group for Cosmetic Dentistry? 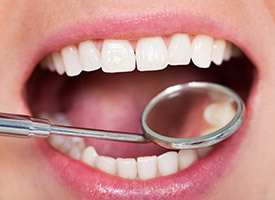 Do you have broken, discolored, or misaligned teeth? How about large, obvious gaps? You may have all of them, and separate procedures to fix each problem would be both expensive and time-consuming. Porcelain veneers offer a much simpler option. They are able to fix and mask all of these cosmetic issues with just one procedure. They are custom-designed ceramic coverings that are fitted to the front of your teeth, and you can get them in as little as two visits. They can give you any kind of result that you desire, whether you want a subtle or dramatic improvement. Lumineers are very similar to porcelain veneers, in that they can correct multiple aesthetic flaws at the same time, but there is one distinct difference: Lumineers go directly onto the teeth as is. 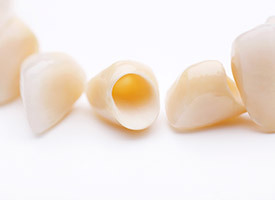 In order for porcelain veneers to lay flat, a very small amount of the enamel has to be removed, but Lumineers are so thin that this step is unnecessary. 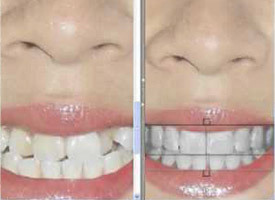 This makes them an excellent option for patients who want to improve their smile without actually altering their teeth. In the past, when having a tooth repaired with a dental crown, you really only had two choices: silver or gold. As you can imagine, this was less than perfect when restoring a tooth that shows prominently in the smile. Thankfully, we now have a much better option: metal-free restorations. 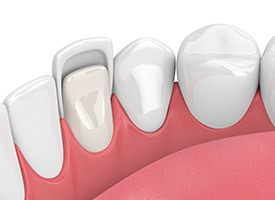 These crowns and bridges are made of 100% white dental porcelain, and they can be designed to recreate the appearance of a real tooth down to the finest detail. In the end, only you and Dr. Robison will know which tooth isn’t real! Don’t you wish you had the ability to simply sculpt your teeth into the perfect smile? With cosmetic bonding, that is exactly what your Canton cosmetic dentist can do. He can quickly fix small imperfections like chips and cracks by applying a tiny amount of composite resin. He’ll mold it to improve your teeth’s shape, size, and even color. The treatment only takes about an hour to complete, and the results are instant. It is one of the fastest and easiest cosmetic treatments available today. The simple fact is that everyone wants to have white teeth. However, keeping them pristine over time can be very difficult. 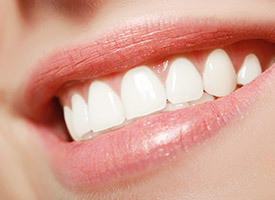 Factors such as coffee, wine, tobacco, diet, and even genetics can easily leave your teeth looking dull and discolored. You can now do something about it . Two quick visits to our office will send you home with a custom-made take-home whitening kit. Our kits are made just for you and use much higher quality products than the ones you can pick up from the store. You simply need to use the kit as directed for 2 weeks tomake your smile 6-10 shades whiter while you relax in your own home. Of course, for people who don’t want to wait that long, we also offer a complete in-office treatment. It brightens your smile just as much as our take-home kits in just 1 hour. You can practically get a new smile over your lunch break. What if you need more than one procedure to achieve the results you’re looking for? That’s no problem! A smile makeover is a treatment plan that combines two or more services. Perhaps you want whiter teeth and a straighter smile. With a combination of teeth whitening and Invisalign, we can help you get both. Or maybe, you want to fix your broken teeth and close the gaps between them. We can do that, too. Dr. Robison will talk to you about all of your options in your initial consultation and will come up with a plan just for you. Does your gum line cause your teeth to look short, stubby, or uneven? Would you say that you have a “gummy” smile? If so, you’re far from alone, and this is an issue we can take care of in just one quick appointment using our soft tissue laser. With it, we can quickly and painlessly remove excess gum tissue to reveal previously hidden dental structure. Then, we can reshape the new gum line along the teeth to create that perfectly balanced look. 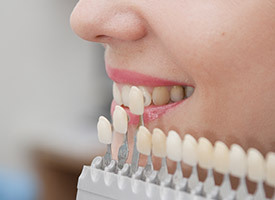 Getting any kind of dental work that can alter the appearance of your smile is a big decision, and we want our patients to go into every treatment with complete confidence. 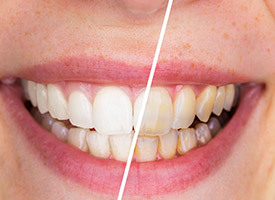 So you can know exactly what to expect, we can edit a photo of your current smile to reflect how it will look after getting teeth whitening, porcelain veneers, or any other procedure you’re interested in. That way, we can make any adjustments in seconds, and you can be sure you’ll love the results. If you’re ready to get the smile of your dreams, simply make an appointment with us today. This first visit is when you can sit down with Dr. Robison and tell him about the exact smile that you want. After that, he can start giving it to you almost immediately. Don’t spend another day hiding your smile. Call today!